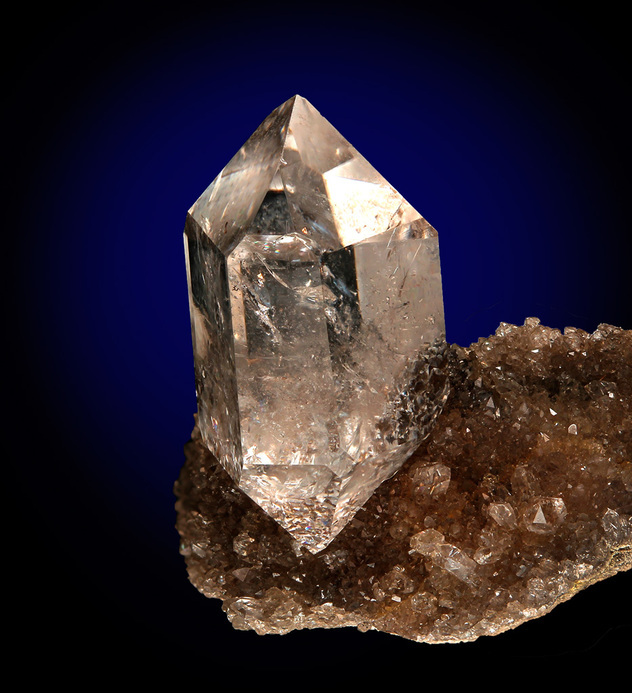 "Herkimer-style" Quartz: Mineral information, data and localities. After 'herkimer diamond', the misleading name for quartz from the Herkimer region of New York State, USA. This is a collective name to group together the many different local names for transparent, lustrous quartz crystals, usually doubly-terminated, often associated with inclusions of petroleum and/or associated with oil or coal deposits within sedimentary rocks. All such quartz crystals formed under low-temperature hydrothermal conditions in the sedimentary rocks. Rarely, these quartzes form also as sceptres. 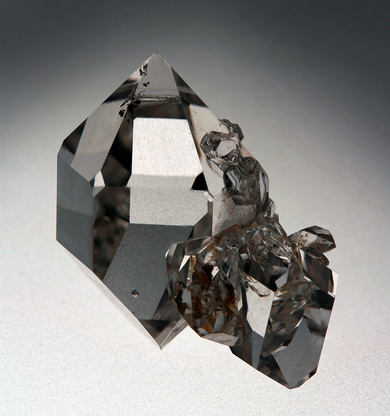 The misleading name Herkimer Diamond has been used locally in the Herkimer region of New York State, USA to describe such crystals since the early 20th century and possibly longer. Apart from the confusion that these are actually quartz rather than diamond there has been growing confusion and arguments in more recent times as the name 'Herkimer diamond' is increasingly associated with other similar quartz crystals from other regions, including those from Hungary, France, Italy, Canada, Pakistan, China and others. Dolomite 34 photos of "Herkimer-style" Quartz associated with Dolomite on mindat.org. Calcite 25 photos of "Herkimer-style" Quartz associated with Calcite on mindat.org. Pyrobitumen 20 photos of "Herkimer-style" Quartz associated with Pyrobitumen on mindat.org. Marcasite 7 photos of "Herkimer-style" Quartz associated with Marcasite on mindat.org. Quartz 6 photos of "Herkimer-style" Quartz associated with Quartz on mindat.org. Smoky Quartz 3 photos of "Herkimer-style" Quartz associated with Smoky Quartz on mindat.org. Pyrite 1 photo of "Herkimer-style" Quartz associated with Pyrite on mindat.org. Ulrich, W. (1989): The Quartz Crystals of Herkimer County. Rocks & Minerals, 64 (2), 108-122. Rykart, R. (1995) Quarz-Monographie - Die Eigenheiten von Bergkristall, Rauchquarz, Amethyst, Chalcedon, Achat, Opal und anderen Varietäten. Ott-Verlag, Thun (in German). Russ, K.-H. (1995): Die Quarzkristalle von Herkimer / New York. Der Aufschluss, 46 (5), 229-232 (in German). Russ, K. H. (1997): Historie, Geologie und Mineralogie der Quarz-Kristalle von Herkimer, New York. Mineralien-Welt 8 (6), 61-71 (in German). Castagliola, P., Cipriani, V., Pratesi, G. & Niedermayr, G. (2006): Die 'Quarz-Diamanten' aus dem Apennin in Italien (Toskana und Emilia Romagna). Mineralien-Welt, 17(2), 58-66 (in German). 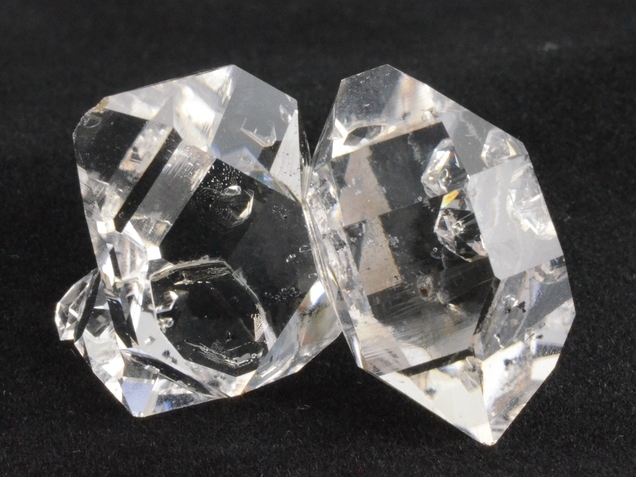 The following "Herkimer-style" Quartz specimens are currently listed for sale on minfind.com. Strasser, M. (2007): "Herkimer Quarze" aus der Ehnbachklamm in Zirl, Tirol. Lapis, 32 (5), 23-24 (Bemerkenswerter Eigenfund). Horváth (2003) Mineral species discovered in Canada and species named after Canadians. Canadian Mineralogist SP6. Alessio Becucci, Simone Boscolo, ad Alessandro Tagliaferri collections. Giuli, G. (1842) Saggio statistico di mineralogia utile della Toscana. Parte II. Nuovi Annali di Scienze Naturali, Bologna, 4, 8, 401-424; Billows, E. (1904) Studio cristallografico sul Quarzo di San Marcello Pistojese. Rivista di Mineralogia e Cristallografia Italiana, 31, 49-97; Billows, E. (1904) Studio cristallografico sul Quarzo di San Marcello Pistojese (con tre tavole). Rivista di Mineralogia e Cristallografia Italiana, 32, 3-6. Cairncross, B. (2004) Field Guide To Rocks & Minerals Of Southern Africa. Struik Nature Publishers, Cape Town, South Africa. Calvo, M. (2016). Minerales y Minas de España. Vol VIII.Cuarzo y otros minerales de la sílice. Escuela Técnica Superior de Ingenieros de Minas de Madrid. Fundación Gómez Pardo. 399 págs. Starkey, R., and Faithfull, J. 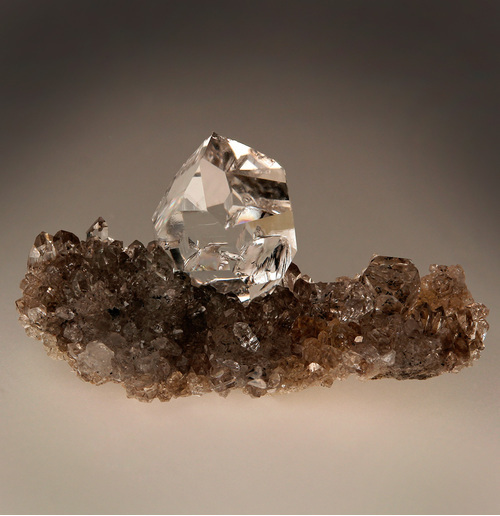 (2015) The history and occurrence of 'Buxton Diamonds'. Journal of the Russell Society, 18, pp. 24-45. New York State Museum (Albany), # NYSM 22367 (originally from Philadelphia Academy of Sciences).